We are placed audible acoustic sensors, ultrasonic sensors, and hydrophones near an earth quake station at Purdue that is also equipped with barometric pressure sensors. The range of frequencies that we are recording are from 0.0001 Hz (geophone) through to 96 kHz (ultrasonic recorder). Because we anticipate that the lower frequency ranges from the geophones will be rare, we will be storing data from all sensors with no gaps for an entire year. Tools that we place to develop include multiple-sensor integration, “big data” visualization, and data synchronization. Our site is located about 8 miles west of the Purdue University campus. It is currently pasture with a small secondary forest patch (~ 5 ha) that supports a variety of wildlife. Cows and other farm animals are commonly using this site. Railroad tracks are located about 1 km away. The goal of the Full Spectrum Initiative is to record, as full of a bandwidth as possible, all sounds that are produced by Earth at one location in order to determine what frequency ranges have natural periodicities and what kinds of cross-frequency “triggers” might exist in nature. Natural periodicities might be, for example, the spike in the occurrence of bird songs in the springtime in temperate regions and associated barometric pressure shifts due to the mixing of cold and hot air that is common to the seasons of this region. 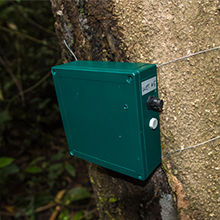 Data collected from this project will help us to understand how sound changes over time and what frequency ranges might affect biological organisms, such as wildlife. The data will also be used to help students studying acoustics understand (1) physics of sound and (2) how sound permeates a variety of disciplines, from earth science to animal behavior. We anticipate our one year study will produce 30 TB of data.